What is the Virgin Media V+ HD box? The Virgin V+ HD box started life as something called “TVDrive” back in 2006, and was available to Telewest customers. The box is a Personal Video Recorder, using a hard-disk to record up to 80 hours of TV shows. 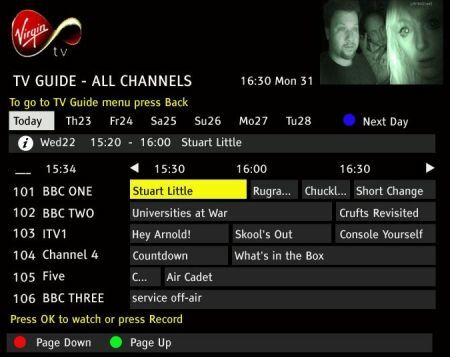 Like Sky’s Sky+ recorder, the Virgin V+ box supports pausing of live TV, series link and an advanced onscreen programme guide. The Virgin Media V+ box can be connected to an HD TV set to provide high-definition on-demand content, as well as live HD. Record up to 80 hours of live TV (160Gb drive). Supports HD programming and on-demand content via HDMI. Record two TV channels, while watching a third (three tuners). Installation of the V+ box costs £49. There’s no purchase cost for the V+ box. There’s a monthly subscription for the V+ service (£5 a month, or free if you’re on the XL TV package). A 12 month minimum contract applies. 1 x HDMI (Hi-def) socket. Q. Can I use an HDMI lead instead of a co-ax lead to connect to my TV? Is there any advantage to using an HDMI lead if there is no HD content at this time? Q. Will the V+ box will allow me to record to it, and to record to my DVD recorder at the same time ? A. Yes, this is possible. If you connect the output of the V+ box to the input of a DVD recorder, then the output of the V+ box can be recorded. We’ve also been told by one of our forum regulars, MrHappy, that the V+ box has a handy extra feature. The V+ box has two SCART sockets – you can record onto DVD using SCART 2 while watching a different programme via a TV connected to SCART 1 (Press V+ > ‘V+ Extras’ > ‘Copy to VCR/DVD’). Q. Can I get the BBC iPlayer? Yes, from April 2008, the BBC’s catch-up TV service, BBC iPlayer, became available on Virgin Media. You can access it via the Red button. More on our Unofficial Guide to the iPlayer. Q. What connectors does the V+ box have? We have a picture of the rear of a V+ box on our BBC iPlayer, became available on Virgin Media. You can access it via the Red button. More on our Virgin V+ box page. Q. Will the V+ box record different channels at the same time for viewing later? How can one record several programmes at the same time ? Q. Can I feed the output of my Virgin Media box to other rooms in the house? A. Yes – You can feed other TV sets using a co-ax aerial cable connected to the aerial out socket, or you can use a wireless video sender connected to a SCART socket. For information on getting Virgin cable TV in other rooms, please see our TV in other rooms section. If you are using an aerial cable to connect, you will need to tune the second TV set to the RF channel number used by the V+ box. The default is channel 52. See the next question for help on checking or changing the RF channel number. Q. How do I check / change the RF modulator channel number? On the Virgin V+ remote, hold the ‘Up’ and ‘Down’ buttons down together and press Reset. Hold ‘Up’ and ‘Down’ keys for approx 15 secs til diag displayed. Left & right keys move pages. Page 2 has the RF setting information. To change the RF channel, move down to ‘RF setting’ then press OK. The Up / Down arrows allow you to change RF channels. Press OK to accept changes. Use Down arrow to save settings & reboot the box. Q. How do I control my Virgin Media V+ box from a second room? “I ran a cable from the RF2 on the V+ box directly to the second TV. I then tuned my TV in channel 6 to receive the picture. I then connected a Technika video and sound sender into the SCART to TV on the V+ box using the included adapter, and placed one of the included remote sensors next to where the light flashes when you press the V+ remote on the V+ box, then simply connected the receiver via SCART to my second TV. The RF cable obviously gives crystal clear picture, and with the video and sound sender I can control ALL functions on my V+ box from my second TV without any menu lost. Hope this info helps some one. The TECHNIKA video and sound sender can be purchased from Tescos.” – Link to Technika AV Sender. I have two virgin boxes one of which is a V+ box and on which is V box. I would prefer to have the V bax replaced with a second V+ box. What is involved and hoe do I go about it? Also on neither box do I have a descriptive leaflet explaining the various features. Can you please supply.